Preheat oven to 400 degrees. 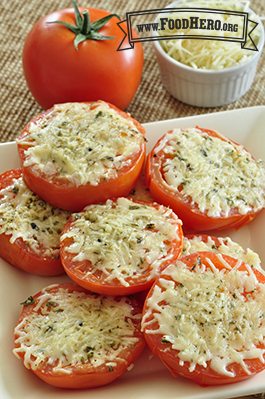 Place tomato slices in a single layer in a shallow baking dish. In a small bowl, combine cheese, oregano, salt, pepper and garlic powder. Sprinkle mixture over tomatoes. Bake 5 to 10 minutes, or until cheese turns golden brown and starts to bubble. Serve warm.